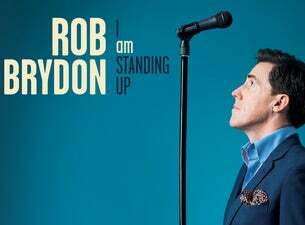 ROB BRYDON, charming Welshman, and cult comedy television superstar from hits The Trip, Gavin and Stacey and Would I Lie To You?, is bringing his brand new live show, I Am Standing Up, to Australian theatres in March 2019. The Swansea-born radio and TV presenter got his big break in 2000 with Marion and Geoff, the series of short comedy monologues on BBC2. He is perhaps best known for his role of Bryn West in the sitcom Gavin & Stacey and the BBC One hit comedy panel show Would I Lie To You? His film credits include Swimming With Men, Early Man, The Huntsman: Winter’s War, Cinderella and Lock, Stock and Two Smoking Barrels. But stand-up comedy is where Brydon is in his element – the perfect mix of charm and wry asides. Rob Brydon’s ad-libs, audience repartee and improvisations are a masterclass in clever comedy and he has been compared to the skill of the likes of Barry Humphries.